Hundreds have been evacuated in southern Chile following a massive double eruption of the Calbuco volcano – its first in over 42 years. The government has declared a red alert, as thick clouds of ash and smoke shot up several kilometers into the sky. The volcano is located near the tourist location of Puerto Varas, about 1,000km south of the capital, Santiago. A total of 4,000 people were reportedly evacuated from the affected area, authorities said, adding that evacuation radius of 20km has been established. “There are a lot of people out in the streets, many heading to the gas stations to fill up on gas,” a resident of Puerto Varas, Derek Way, told Reuters. There have been no reports of injuries or deaths so far. However, LATAM Airlines canceled flights to and from Puerto Montt. "In this situation, with the eruption column so high, the main risk is that [the volcano] collapses, falls due to gravity because of its own weight and causes a pyroclastic flow," Gabriel Orozco, a volcanologist with Chile's geological and mining service, told local TV. Espectacular imágen del #volcan de #calbuco. pic.twitter.com/9PH9Us5nPb"
The first eruption threw cloud of ash 10km into the sky. It was followed by the second eruption. The volcano may start oozing lava, and may cause the melting of ice, and ultimately floods, the National Geology and Mining Service said on Twitter, adding that a third eruption was likely over the next few hours. "People are very, very frightened," Gervoy Paredes, mayor of Puerto Montt, told AFP, "The situation is pretty complicated," adding that reports showed the Blanco River was flooding because of ice melt caused by the eruption. The area near the volcano is not densely populated, making it easier for the authorities to conduct evacuations. Calbuco’s last eruption was in 1972, while it is one of Chile’s most dangerous active volcanoes. Volcanic eruptions are frequent in Chile, where about 500 volcanoes are potentially active. It is considered to have the second largest chain of volcanoes in the world, after Indonesia. 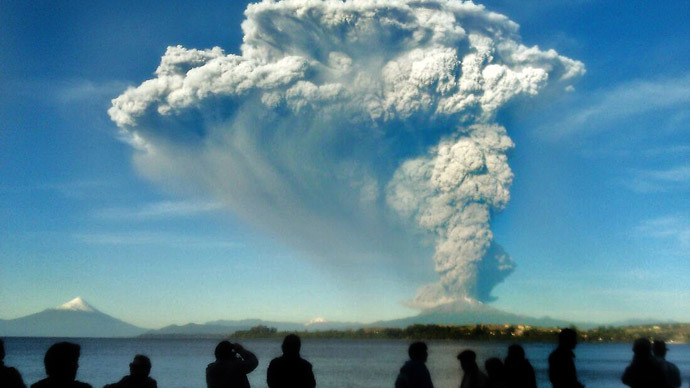 Southern Chile was a sight of a volcanic eruption back in March, when Villarrica sent ash and lava into the sky.